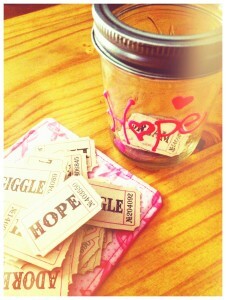 I introduced the little jar of HOPE this past weekend at a Breasties party. Guests are invited to write the name(s) of a loved one affected by breast cancer on a ‘ticket’ & then place it in the jar of hope as they say a little prayer or sing a little song in their heart. I came up with this idea because I meet so many people affected by cancer & I carry them all in my heart every single day BUT the 3-day is where thousands of people will be walking with hearts bursting at the seams, pink ribbons pinned to max capacity, memorials plastered across the backs of t-shirts & tutus worn despite the chaffing…all of that because we LOVE. With all of that in mind I thought it only made sense that I collect the names of my fellow Breasties loved ones that have been affected by breast cancer so I too can do my part in making the 3-day the most BEAUTIFUL act of SELFLESSNESS mankind will ever see. Please comment here if you would like to virtually add a name to my little jar of HOPE. He used the “F” word. From bachelorettes to baby bumps! Breasties 5K team is growing!